Delft University of Technology (TUD) issued a tender for a new Card Management System(CMS) to handle multi functional DESFire cards and connect to the many facility systems on campus. Providing the best solution, ScreenCheck was assigned to implement the Card Management System “CardsOnline”. CardsOnline creates one central, full integrated system for enrolment, printing/encoding and issuing multi-purpose ID smartcards. CardsOnline offers full card control in one system. To maintain the highest level of security, the TUD decided to introduce the MIFARE DESFire EV1 8k card to students and employees. This required the replacement of the obsolete CMS. New CardsOnline 6.0 matched all the TUD requirements and more. Full integration with student and employee systems and also with client applications for (5)access control, payment, library and lockers providing a real one-card-solution. The new CMS had to be able to create a connection with various applications on the DESFire cards and encode all speciﬁc data for these applications during the in-line print process. After printing and encoding all systems are informed about the existence of the new card with its encoded identiﬁers that are linked to the cardholder. ScreenCheck implemented CardsOnline connecting with the centralised data system. 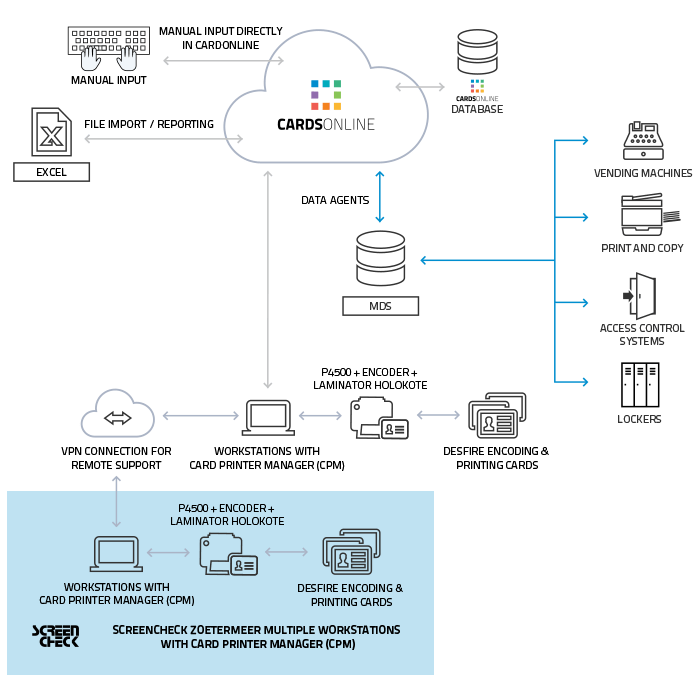 CardsOnline uses webservices to exchange data and prints and encodes all required data on the DESFire 8K EV card. In total the Delft University of Technology card can operate 11 diﬀerent applications. At seasonal peak (Januari and September) ScreenCheck takes over the bulk printing for new TUD cards, this saves the TUD a lot of time and an access of printers. Also the special Library Card for all non TUD Library members is produced by ScreenCheck. ID smartcard that can be used for identification, get access to the school and related buildings such as the Library and make payments for Catering, Follow-me printing, Copying and their Cash registers.